Sometimes IT management can feel like a security treadmill—you respond to threats as they appear but never gain any ground. It’s hard enough responding to ...known threats on common platforms, but dealing with newer, more sophisticated attacks that target your PCs or mobile devices can lead to major headaches. That challenge becomes even more daunting with the rapid increase in the consumerization of IT (CoIT) and bring your own device (BYOD) trends. You need to accommodate an increasingly wide range of mobile devices that don’t easily integrate into your existing security infrastructure, but that are targets of a growing number of threats. With so many security challenges, it can be costly trying to protect employees, customers, data, and your company’s reputation. But of course the costs of ignoring the challenges can be much higher. In the second quarter of 2012, McAfee Labs reported the biggest increase in malware samples detected in the last four years. 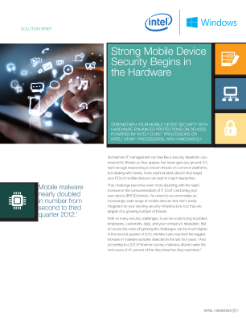 Read the full Mobile Device Security with Windows* 8.1 Begins in the Hardware Solution Brief.